A lot of users continue to use the plugin Simple Ads Manager and ignore plugin SAM Pro (Free Edition). 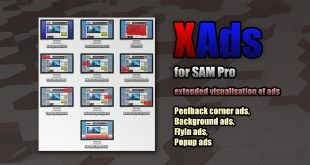 Plugin SAM Pro (Free Edition) – is a completely redesigned plugin Simple Ads Manager, in a sense, it is modern reincarnation of Simple Ads Manager. During the developing plugin has been changed the kernel of plugin, changed the administrative interface of the plugin to a more comfortable and modern, changed the basic functions for a more reliable and stable operation, all modern requirements of security and stability to prevent hacker attacks have been met. The old version of the plugin (Simple Ads Manager) has been left in the repository WordPress for the simple reason that there are a lot of users using servers running PHP 5.2. Consider the pros and cons of both plug-ins to each other. The intersecting sets of prohibitions and permissions. In practice, this means that, for example, if you allow the display of ads in the articles belonging to a set of some categories, you can prohibit displaying the same ad in another set of categories and if in some article these sets will intersect (article belongs to one or more of the categories from the black and white list), then the rule will trigger the ban. This can seriously improve the flexibility of the display logic, although it is used infrequently. In SAM Pro this option is not available, you can either enable or deny it. Why? Because everything has a price. 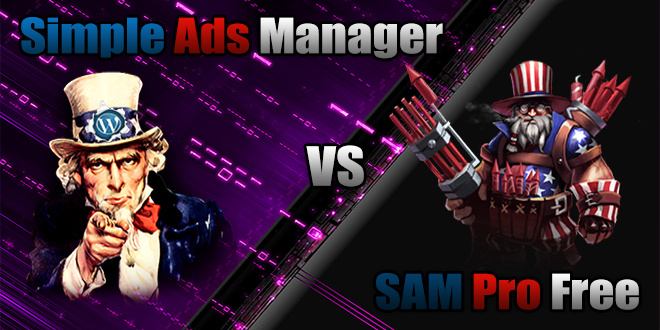 Ceteris paribus, a request for the current ads in the SAM Pro runs twice faster than in the Simple Ads Manager. Alas! This is the only plus of the Simple Ads Manager plugin. Outdated management interface. Every action of site admin acts by reloading current page. It is very annoying me — I have no extra time. Security. Alas, this is a weak point of the Simple Ads Manager plugin. And if the administration pages are more or less in order, on the client side critical data passed to an AJAX request is encrypted public key, it can provide access to this data for scammers for using SQL-injection attacks. Of course it’s not as scary, but theoretically it is possible. Non-optimized statistics. Simple Ads Manager plugin stores statistics unoptimized, i.e. for each event has a record in a database table. As a result, we have the uncontrolled growth of the volume of data in a table, which can lead to sad consequences – data space on HD is not a rubber and has a finite volume available for data storage. Unsuccessful structure of stored data. All ads are tightly bound to the object “Ads Place” and are part of the structure of the Ads Place, which does not allow reuse of promotional ads in other Places. There are other less serious disadvantages, but most important I listed above. Modern management interface. Almost all actions of the administrator are executed using AJAX requests, which saves a lot of time. Security. Most sensitive data transmitted through AJAX encrypted using private key. Unique key for each site is created when you first install the plugin. This seriously reduces the vulnerability of plugin before hacker attacks. Statistical data. Statistics are stored in optimized form, which saves disk space and allows you to extend the range of storing statistics. Reuse of ads. Ads exist separately as independent objects. This allows you to connect and use the ads with any number of advertising spots (Places). Optimized queries. The ability to use only those rules (prohibitions and permits) that needed on this site allows you to optimize the length of queries, which significantly increases the performance of the plugin. Addon API. Addon API allows you to extend the functionality of the plugin SAM Pro (Free Edition) using addons (extensions). Anyone can develop an addons. Official addons are available on the website of the plugin. There are other minor pros. The impossibility of using intersecting prohibitions and permits. See Pros of the Simple Ads Manager plugin. Currently the plugin Simple Ads Manager is locked in the WordPress plugin repository because of mismatch to new rules of security for WordPress plugins. Frankly, I don’t want to lose my time for revision of outdated plugin. Try to convince me. Commenting is encouraged. You can download the latest version of the plugin Simple Ads Manager from GitHub and use it at your own risk. According to fellow developers, the main drawback of both plugins is too many opportunities for the free version. Maybe we should cut back functionality of these plugins? WILL my existing ads carry over to an installation of SAM Pro? Switched and now none of the Ad Places display ads randomly. They always start with the first ad saved. How do you set up a random display? I’ve run the migrator, but none of the Ads appear on the Ads page. I see them in the db in the sampro tables, but no interface. what is happening? I’ve run the migrator from SAM to SAMpro, but I’m not seeing any Ads on the Ads page. I do see them in the sampro_ads table though – why can I not see them in the interface?